Last week, I introduced you guys to our sound editor, Shaun Burdick. Today, I thought I'd spotlight a person you're already familiar with, our editor Thomas Smith. (Cue applause) Yes, I know, you're all sick of him, by now. Me, too, but I have to live with him. "Smith has the clip. He's lining it up with the previous clip ... shhhhhh ... and they flow! What a comeback after that jump-cut in scene eight! Smith is really turning this film around. Now for the next clip ... shhhhh ..."
Editing does not get the appreciation it deserves. Watch a movie, any movie. If you notice the editing, the editor has not done his job correctly. A film should flow so well you don't pay attention to the cuts, you pay attention to the story. Now, considering an editor has to deal with figuring out which takes (of the many) make up the best acting performances, most visually appealing camera work and leave out any flubs which may have occurred (not that we would know anything about that, right? ), his job is lot more difficult than you might think. You directed The Night Shift, and now you're editing it. 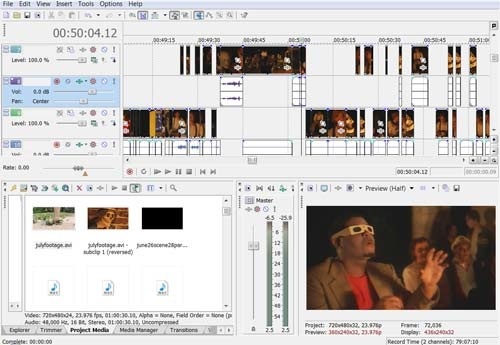 Do you think your experience as director has helped or hindered editing, and why? It definitely helps. I have the scenes in my head a certain way but if something isn’t working I can immediately re-work or cut it at my discretion without stepping on anyone’s toes, other than my own. A good example of this occurred recently while editing a heavy dialogue scene. There was a zombie gag happening in the background while the characters were interacting. On paper, the scene worked. On film, however, the gag ended up being too distracting. The dialogue in the scene was very important and to keep cutting away to a gag or a lot of commotion in the background was a huge distraction and the bit was easily cut. The scene itself turned out fine and the gag isn’t missed. Also, I have a pretty vivid recollection of what was shot and how it turned out so I know while editing what other takes and shots I have to work with so I’m constantly thinking about how this shot will play into the next, so on and so forth. How is editing the feature different from editing a short? It’s pretty much the same, only with a lot more footage and a lot more pressure. Not pressure from anyone in particular, but pressure from myself to make it the best it can be and get a rough cut together in a timely manner so I can move on to the next phase of post-production. How is the movie looking, so far, and when do you think we might have a rough cut finished? I haven’t had any major issues so far while editing, but everything looks promising. Fingers crossed. Hopefully I’ll have a rough cut in the next month or so. Hopefully. What has been your greatest challenge in editing The Night Shift? Finding the time to edit. It’s difficult to work a daily office job and come home to deal with life and all of its minor inconveniences on the weekends and evenings, while trying to find time to edit a scene. A rubber tree. Just sounds like it would be a little more fun than "oak" or "pine" and less depressing than "weeping willow." "Rubber tree" just sounds like a natural bounce house of fun, right? Okay, so the last question was irrelevant, but I hope that this has given you some insight into what we're dealing with right now. This is the least fun part, but it's also really interesting. When there's a new scene to watch, it's kind of like getting to open a Christmas present. We're getting there, slowly but surely. Our little ghost girl came over last night to finish her off-screen voice-over work, and our ghost boy will finish his next week. Clips have been sent off for special effects work, and we're looking up agents to see if anybody out there is interested in representing us (pretty please?). We received an email from the Drunken Zombie Film Fest the other day. The short played there a few months ago. As it turns out, it went over really well, and they're excited for the feature! That's what keeps us going. There's a lot of hard work that's gone into this, and a lot of hard work yet to be done, but the encouragement and support that we've gotten from the people that we're making this for is the driving force behind completion. Thank you. All of you. Anyone who's ever seen the short, sent an email, or posted a blog. You are so very appreciated. Next Week: More on our awesome post-production team! In the meantime, learn more about The Night Shift at www.thenightshiftmovie.com. You can check out the poster, trailer, cast and crew, and some fun downloads. Heck, if you like, you can even be our friend on Facebook and Twitter (@NightShiftMovie), where you can follow more of the progress of the movie.